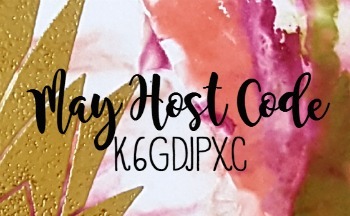 These are my final two cards for the May Creative Crew challenges at Splitcoast. 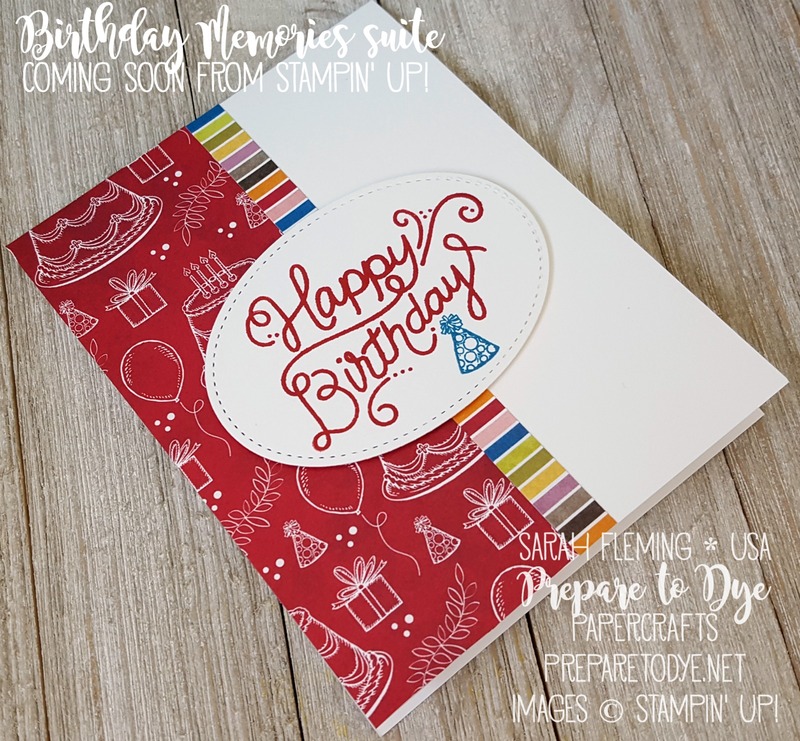 For the Step-It-Up challenge this month, I am featuring the Birthday Memories suite, which should be available to customers June 1. The theme is “sweet surprises”. The SWEET part of these projects is the cake all over the DSP, and the SURPRISE is that there is beautiful DSP that features Real Red that isn’t Christmas or Valentine’s Day paper! So I chose to really feature Real Red on these cards, because it’s one of my favorite colors, and I’m so happy to have FUN Real Red paper. This card is my Clean and Simple version. The stepped up version is next and has an extra surprise. My stepped-up card has lots of additions and a subtraction. 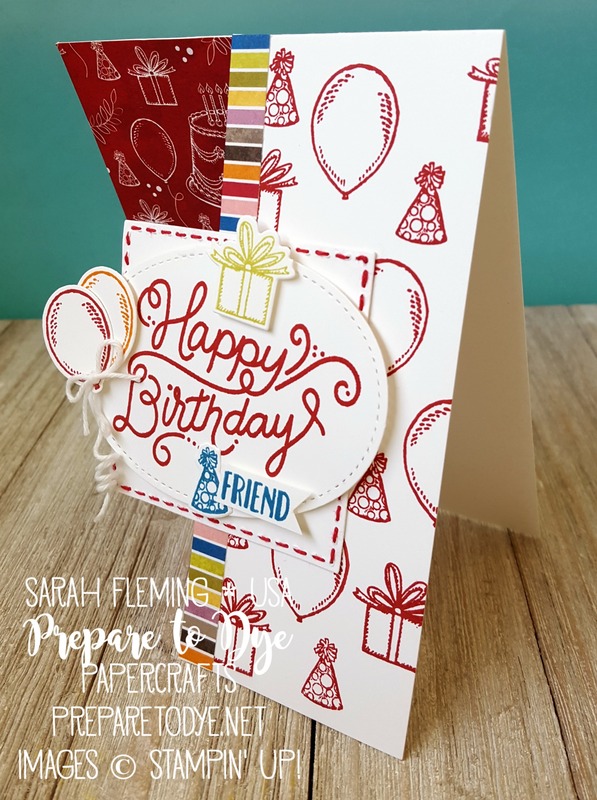 First, I stamped the right side of the cardfront using the Birthday Delivery stamps that directly coordinate with the paper on the left, to make my own contrasting DSP-type background. I didn’t stamp the cakes, because the cake stamp in this set is huge and would have overpowered all the other fun details. I just adore the tiny party hat and gift and balloon. 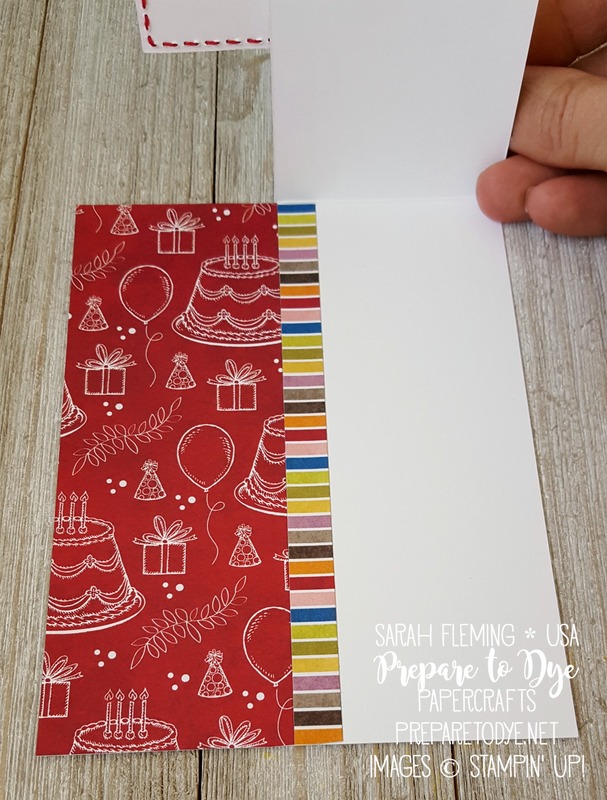 I love how the stamped background turned out! Actually, back up. 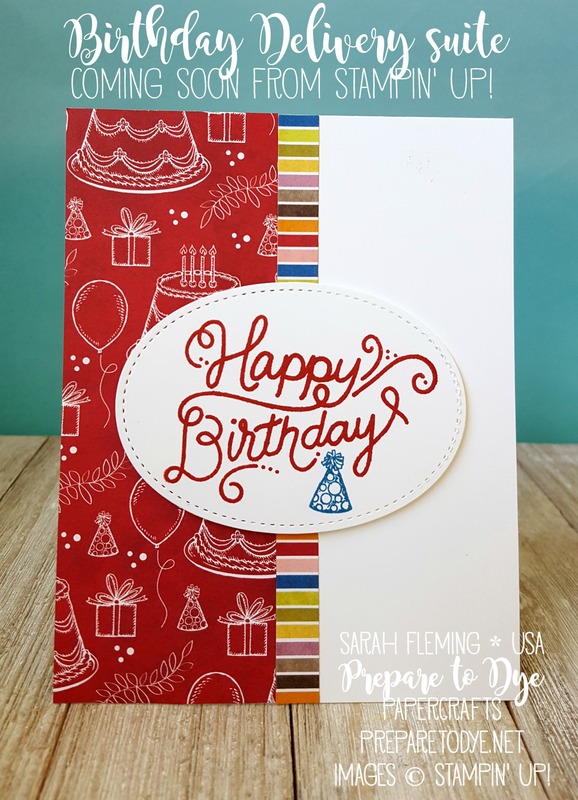 Before I stamped the right side of the cardfront, I… took off the left side! So the gorgeous Real Red paper is actually on the inside of the card, because there’s no cardfront on the left side. After I cut the card base, I cut off the left 2″ of the cardfront. It’s important to do this before scoring the cardstock so you don’t have issues with cutting on the score line. After cutting then scoring the card, I glued the strip of striped paper on top of the right side (the front), then opened the card and glued an identical strip to the inside. This is the card standing up. I again stamped the sentiment in Real Red on Whisper White and cut it out using an oval from the Stitched Shapes Framelits. This time, I also cut a stitched square out, then stitched around the stitches with a small needle and three strands of Real Red Solid Baker’s Twine (from the retired Candy Cane Lane Baker’s Twine set). I glued the right side of the stitched square to the cardfront, then popped the oval up on Dimensionals on top of the square. 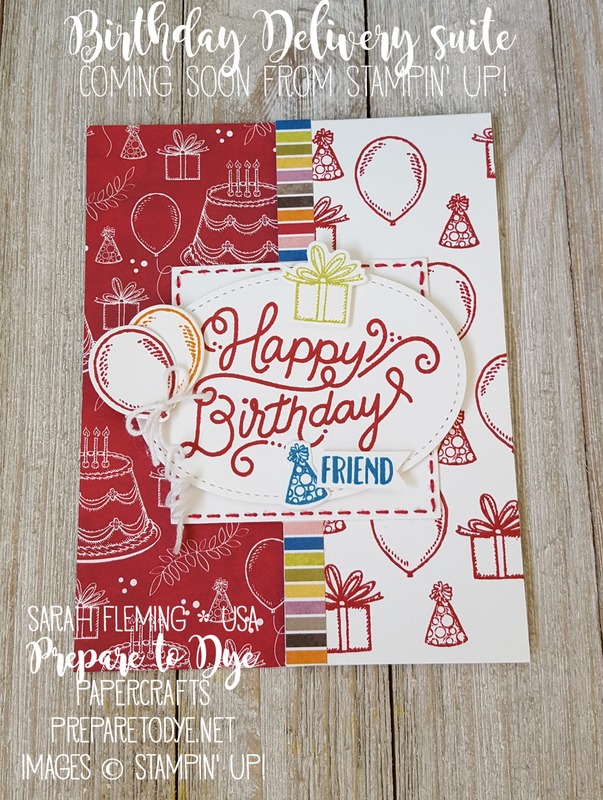 I stamped and cut the balloons, hat, and gift using the stamps and dies from the bundle. The balloons & gift are on Dimensionals, but the hat is flat. I hand-cut “friend” with my Snips. I hope you like both of these cards and that you like the additions (and subtraction) I made for my stepped up card. Thanks for visiting!